Developers, like all entrepreneurs, are great problem solvers. Problems of all varieties occur, and while efficient access to accretive debt financing won’t rate as one of Donald Rumsfeld’s “unknown, unknowns,” the recent challenges associated with securing a construction loan have had, and will continue to have, significant impacts on the developer. As we start to find some stride in the recovery, especially on the development side, why the sudden slowdown in construction lending? Why, prior to an increase in defaults, prior to a recession, prior to a major macro-economic event (all of which would have lenders pump the brakes) are we experiencing a slow down? Isn’t this the time in the cycle where lenders typically loosen up, gain some confidence in the cycle, and compete by loosening their underwriting standards to secure some of the limited number of vibrant construction loan opportunities in the market? Yes. That’s how it usually goes. 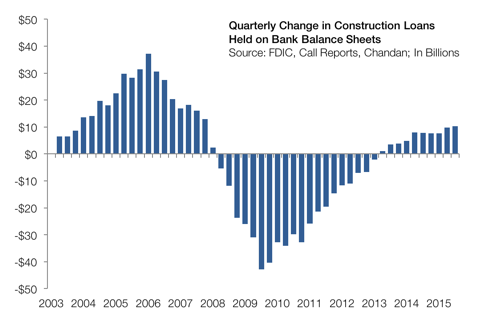 Aside from all of the discussion about a slowdown in construction lending, and anecdotal evidence of the same, it is important to realize that the long-term trend is good. Look at the FDIC data showing construction loans on balance sheet, nominally as well as in year-over-year percentage terms. Clearly, things are moving in the right direction. 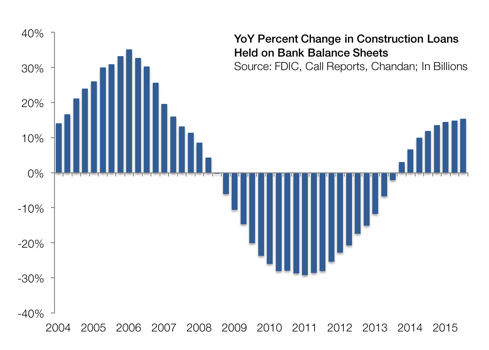 However, banks’ total construction exposure was only $266.1 billion in the third quarter of 2015, a far cry from the 2008 peak of $626.5 billion. While the trend is good, and we would argue this is a good time to make construction loans (many assets are trading well above replacement cost), storm clouds are on the horizon. The storm, if you will, has been off the coast for over a year and only recently, having percolated through the regulatory framework of the lending community, has it made landfall. Basel III hit the books in January of 2015. This regulation defined most acquisition, development, and construction loans (AD&C) as requiring 150% of the typical capital reserves. It also requires 15% of the completed value of the project to be funded with cash (not imputed land equity). The implications on banks’ capital ratios, depending upon their portfolio composition, can be significant. Many of the banks prepared for the storm at the first indications of trouble, changing their approach to construction lending as soon as the regulations came into effect. Others have tried to call the storm’s bluff, refusing to adopt or not choosing to adopt yet, any policies which accommodate the changes. And while that alone isn’t directly impacting the construction lending, increased regulatory oversight and audits on banks, with a rigorous focus on “High Volatility Commercial Real Estate” (HVCRE) has had a clear impact on lenders and they are seeking shelter by tightening credit standards and lowering advance rates. Further, while not explicitly stated, many in the industry are of the opinion that the Fed/regulators are indicating that construction lending is NOT a product well suited to regulated banks. The underlying message may be that the shadow banking system should provide a natural home for construction lending activity. The following two exhibits from the Fed provide some clear evidence of the pull back (emphasis added). The reactions to regulatory pressure, accentuated by the Fed’s November communiqué, vary widely, from no change to a full halt to construction lending. If you are in the business, someone might well have moved your cheese. Below, in my notes from conversations with several capital providers, you’ll find varying interpretations that only further complicate the storm. “HVCRE will require 150% of normal reserves. Eight percent reserve is the minimum for a bank. If all loans are HVCRE the bank would need to move to 12%. That capital reserve is the same amount as what’s required for holding a loan as 90 days late. Some banks are looking at all the construction loans as being HVCRE, and reserving against that, just to be safe from the regulators. The FDIC didn’t even understand the Dodd Frank stuff. The FAQs were unclear and conflicting. The FDIC still didn’t know until Q3 2015. The regulators are now getting up to speed, and they are leaning on the banks. “There is considerable confusion about Basel III. SFR tract is not HVCRE. More than three units of attached product and it does apply. But, some others will say that condos do not apply. There is a lot of volatility in interpretation. No 150% rule on SFR detached. If we have to put up higher reserves, we charge more. We stayed away from more than four units to avoid the HVCRE. Marginal deals may be left out as banks become more selective. Relationships — This business is still largely relationship driven. Aside from the personal connections, banks that enjoy a rich depository connection to a borrower are going to be far more willing to accept the burden of a 1.5x on loan reserves for construction loans, and the increased regulatory scrutiny, than a bank looking at a one-off construction lending opportunity. Smaller banks — Banks below $2B in assets are much less impacted by Dodd Frank. These banks will not do your $55MM construction loan (it’s just too big), but they might happily fund your $12MM loan. They, I suspect, will see a significant competitive advantage in this new environment. Unless you are a marquee client, it might make sense to steer away from money center banks and towards the best local bank(s) in your market. Diversify — Don’t put all your faith in one lender as the go-to source for construction debt, or any CRE debt for that matter. Few bankers can back statements like “we’ll be there for you” when both the regulators and the credit committee/credit culture of the bank can veto that sentiment. Know thy banker — The best bankers know what will fly in their institution and how to get deals done. A close alliance with them can make sure both you and the banker successfully fund your deals. Use an advisor — It’s a jungle out there, and unless you are in the market every day, it can be tough to know where the best opportunities reside. As with many markets, you might benefit from engaging a professional to advocate for your borrowing needs.